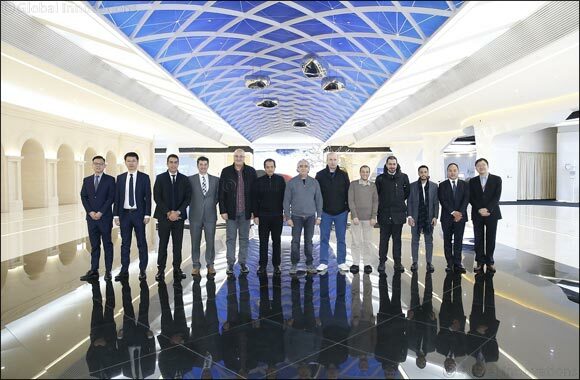 Doha, Qatar, February 10, 2019: Representatives of Qatar’s Ministry of Commerce and Industry (MOCI) along with senior officials, businessmen and CEOs of major Qatari companies have visited Huawei’s headquarters in Beijing, China to gain a deeper understanding of how the latest ICT solutions can contribute to the digital transformation era. The visit took place on the sidelines of the Qatar-China Business Forum, which was organized by the Ministry of Commerce and Industry on 31 January 2019 in Beijing. The forum brought together government officials and representatives of the Qatari and Chinese private sectors. On the sidelines of the forum, Qatari and Chinese participants signed a number of memoranda of understanding in a bid to enhance cooperation in the fields of technology and information technology, promote the exchange of expertise and technical knowledge and bolster investment partnerships. These efforts will assist the Qatari government in its efforts to build a diversified, knowledge-based economy. This visit to Huawei’s headquarters is intended to strengthen cooperation between Qatar and China within the framework of the Qatari government’s efforts to attract foreign direct investments into non-oil sectors. By channeling investments into its non-hydrocarbon sector, particularly its industrial, trade, and information technology sectors among others, Qatar seeks to achieve economic diversification in line with its National Vision 2030. To demonstrate the power of ICT to accelerate the growth of all industries, Huawei gave the Qatari officials and businessmen insider access to their state-of-the-art laboratories and research centers as well as the opportunity to meet with top executives to discuss ICT’s role in driving the development of key vertical sectors. This visit and discussions will help Huawei to better serve Qatar’s national ICT and telecommunication needs in the long-term. Huawei is one of several fully-owned Chinese companies with a license to operate in Qatar. Chinese companies that choose to establish a presence in Qatar can tap into a multitude of investment opportunities through development projects being undertaken within the framework of the Qatar National Vision 2030 and ahead of preparations to host the 2022 FIFA World Cup. In addition to being offered up to 100 percent ownership across various industries, Chinese companies may benefit from Qatar’s strategic locale between East and West to expand their businesses to regional markets while enjoying the freedom of transferring capital to and from the country among other incentives. These include an advanced network of free zones and logistics and industrial areas in line with the highest international standards.